Join us for Talking Spirits Cemetery Tours XXI Public Day tours. On the 90-minute walking tour, local actors share Civil War stories through portrayals of Wisconsin soldiers and citizens buried at Forest Hill Cemetery. Sunday Tours leave every 20 minutes starting at 12:00-4:00 PM. Purchasing tickets online will allow you to book preferred time slots of tours. Don’t want to miss out? 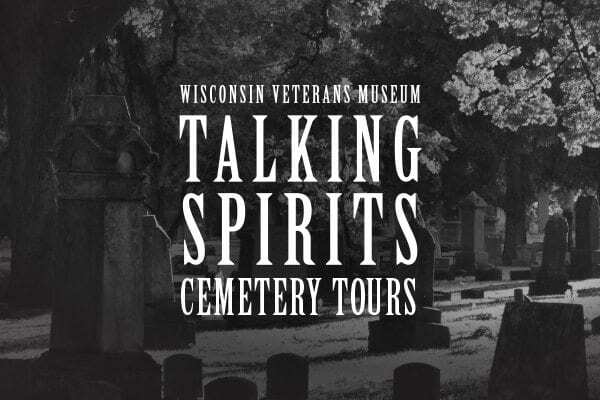 Click here to join our mailing list to receive updates on Cemetery Tour 2019 and other Wisconsin Veterans Museum events. Held each fall at the beautiful Forest Hill Cemetery in Madison, this award-winning living history program illuminates the lives of many prominent and lesser known-figures in Wisconsin history. Tours will focus on the contributions of Wisconsin’s soldiers and citizens during the Civil War. Local actors and actresses don period dress, giving viewers a first-person encounter through scripted vignettes. Tour guides lead informative discussions of the cemetery’s rich history during the 90-minute walking tour.